Let’s start by taking a look at some of the not-so-obvious features of this narrative. Jesus is in a town called Bethany across the Jordan, when a messenger arrives from another town called Bethany in Judea. The messenger is sent from his friends Mary and Martha, asking him to come heal their brother Lazarus, who is seriously ill. Now, unbeknownst to all but Jesus, Lazarus is already dead! It takes some math to work this out; based on the chronology and the distance between the two Bethanies, it turns out that Lazarus died the same day the messenger was sent. Just maybe this explains why Jesus was in no hurry to head to Judea to heal Lazarus and lingered two more days. Even so, his delay meant that Lazarus’s sisters would suffer an additional two days of grieving. We can only assume that Jesus had his reasons. Now, in what is one heck of a prophetic double entendre, Jesus explains that “this illness does not lead to death; rather it is for God’s glory, so that the Son of God may be glorified through it.” The double meaning is in the phrase “that the Son of God may be glorified through it,” which can mean both that Jesus will receive honor and that he will be crucified because of the raising of Lazarus. For throughout this Gospel, Jesus’ glorification is a code word for his crucifixion. And indeed, later on, we’re told that the chief priests plot to kill Jesus precisely because of the stir he caused by raising Lazarus. After a similar scene is repeated with Mary, we find Jesus expressing some unexpected emotions—emotions that the English translators do their best to obscure! Here is a literal translation of verse 33: “When Jesus saw [Mary] weeping, and the Jews who came with her also weeping, he angrily snorted in his breath and agitated himself.” In other words, Jesus was angry at something or someone, and he began to fume and make himself upset. Why the anger? Scholars have proposed a couple of possibilities: maybe he was angry at Mary’s tearful lack of belief; maybe he was angry at the power of sin and death. I have another idea. Maybe he was angry because circumstances were forcing him to perform an action that would ultimately result in his death. For now the miraculous sign that he had intended to do all along was going to be a public event, witnessed by a crowd of Jews from Jerusalem. Inevitably, news of the miracle would make it to the Jewish authorities, who could be expected to react just as they did: they plotted to get rid of Jesus—permanently. With no explanation, Jesus moves from an angry snort to tears. He literally bursts into tears. Is he crying for himself? I don’t think so! Here we see the divine Son of God, the Word made flesh, God Incarnate, at his most human. He weeps purely out of empathy for Mary and the others, even though he knows that their mourning is about to be replaced by wonder and joy. 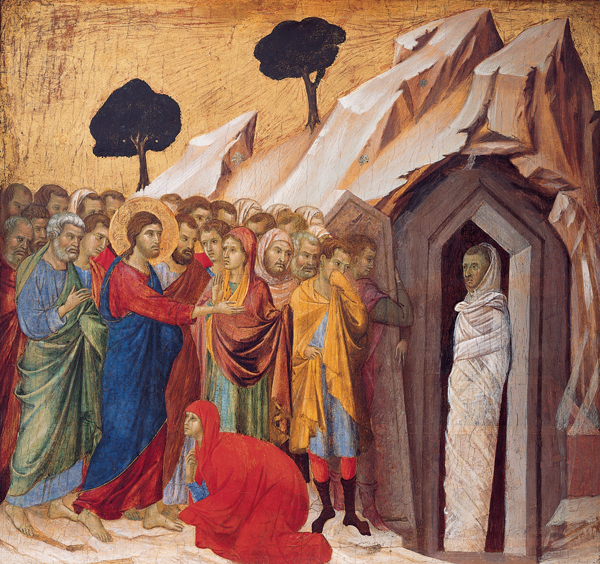 Next, Jesus proceeds to the tomb, orders the stone blocking the entrance to be removed, prays to his Father, and then yells out to Lazarus: “Lazarus, come out!” And the dead man does come out, despite the fact that his hands and feet are bound and his face is covered with a cloth. The Church Fathers understood this part of the story as a miracle within a miracle. They imagined that Lazarus’ body was miraculously transported to the mouth of the cave that entombed him. The other alternative is that Lazarus woke up bewildered on a stone shelf, rolled his legs off the shelf, and hopped like mad toward the light issuing from the mouth of the cave. If that is the case, I can understand why St. John omitted this bit of comic relief from his solemn account. In any case, Lazarus is then untied and resumes his life. But there is one caveat: later we are told that Lazarus, like his master Jesus, lives under a death sentence. Whether he escapes or whether he dies a martyr’s death, the Bible never says. As I mentioned before, this account is not a newspaper story; it has a theological and a pastoral point. The theological point is stated by Jesus himself, namely, that Jesus is the fount of resurrection life. The pastoral point is that, by hearing this account, you may come to believe in Jesus and have eternal life. And yet, so many find it hard, if not impossible, to believe this story of resurrection (or indeed the story of Jesus’ own resurrection); resurrection just doesn’t fit their worldview. God has offered us an incomparable sign of his power over death, and people reject it precisely because it is incomparable. We have been taught that “seeing is believing,” and admittedly, we have seen nothing to compare with the resurrection of Lazarus. Now, it’s true that none of us here has witnessed the resurrection of a dead body. But I claim that each of us here has witnessed life come out of death. Have you ever witnessed enemies reconcile? That is life out of death. Have you grieved for someone who died, sure that your life was over too, then one day realized there were still things you were meant to do in this world? That is life out of death. I remember the day I had to euthanize my dying dog. When I got home from the vet’s office, I emptied my jacket pockets, and I found an old church bulletin for this very Sunday, with a picture of Jesus reaching out his hand to Lazarus. For me it was a sign from God, and I felt reassured that there would be new life for my little dead doggy, and continuing life for me as well. Again, life out of death! All of us, if we but keep our eyes open, can be witnesses to the reality of resurrection life. Little resurrections happen all around us! What about new life for this parish? Every Sunday this congregation prays for it. And there is no doubt that we need it. We have room in our sanctuary, and room in our hearts, to bring Good News to many more people than we currently do. Like Mary and Martha, we pray, and we do what we can, while we wait for the Lord to arrive and bring new life. Now, it’s hard to wait when someone or something we love is in danger of dying, and it’s all too easy to lose hope. And when the final deadline has come and gone, then only the foolish or the very faithful hold fast to their hope. I pray that we may be very faithful, that we may be steadfast in our faith in Jesus as the Lord of Life—even if he comes a few days late, even if he misses the deadline. For as the story of Lazarus tells us so powerfully, with the Lord of Life it is never too late! © 2014 by Darren Miner. All rights reserved. Used by permission.